Look to Eaton Vance for advanced solutions and timely perspectives from industry experts across five highly specialized investment affiliates. We value independent thought and embrace a diversity of ideas that bring a deeper understanding of the issues that matter most to sophisticated investors. The views expressed in these videos are those of the authors and are current only through the date stated. These views are subject to change at any time based upon market or other conditions, and Eaton Vance disclaims any responsibility to update such views. 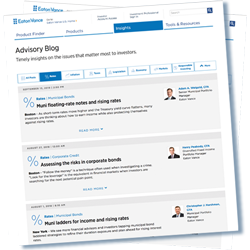 These views may not be relied upon as investment advice and, because investment decisions for Eaton Vance are based on many factors, may not be relied upon as an indication of trading intent on behalf of any Eaton Vance fund. The discussion herein is general in nature and is provided for informational purposes only. There is no guarantee as to its accuracy or completeness. Past performance is no guarantee of future results. Get daily commentary and insights on a host of today’s most relevant topics. From global market and economic developments to investing trends and advanced solutions, our thought leaders share their unique ideas and perspectives.